I've been run down for the past couple of days, feeling tired, coughing, sore throat and headaches. I'm definitely in need of a boost of vitamins and I figured some of you might be feeling the same as me as it seems to be going around. 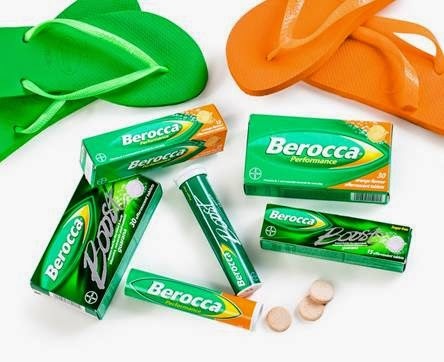 Berocca are giving my readers the chance to win €100 worth of Berocca products and a pair of Havaiana flip flops! Berocca Performance is specifically designed to improve physical and mental performance. It's clinically proven, winning combination of high dosage levels of B and C vitamins and other essential minerals, zinc and magnesium work together to ensure you are at your best all day long. Containing Guarana, a natural energiser with a fast onset of action, Berocca Boost provides a fast effective energy boost. It works in synergy with a combination of B vitamins and minerals to create a potent, clinically proven formulation that quickly increases reaction speed and accuracy while decreasing tiredness. If you would like to be in with a chance of winning, answer the following question in a comment and leave your contact details. The competition will close next Friday July 25th at midnight GMT. Unfortunately this offer is only open to Irish readers. In which country was the FIFA 2014 World Cup held?